Snepp, prior to becoming a CIA agent, signed an agreement that he would not publish classified information, and that he would submit any materials he intended to publish for agency review. After leaving the agency, he published a book of his experiences without prepublication review. The book contained no classified information. The Government brought suit to enjoin further breaches of the agreement and to compel Snepp to turn over profits from the book. 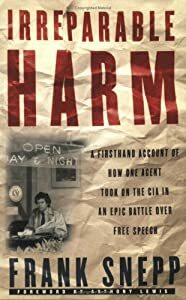 DC found Snepp had “willfully, deliberately, and surreptitiously breached his position of trust with the CIA and the secrecy agreement” by publishing his book without submitting it for prepublication review. Also found Snepp deliberately misled CIA officials into believing that he would submit the book for clearance. Finally, it determined as a fact that publication of the book had caused the U.S. to suffer irreparable harm and loss. The CoA reversed the order for the constructive trust, saying that Snepp had a right to publish nonclassified information. Is a constructive trust a proper manner of disgorging the profits of one who abused a confidential position? A constructive trust is a proper manner of disgorging the profits of one who abuses a confidential position. Where one abuses a position of trust to the detriment of the one placing the abuser in the position of trust, any profits derived therefrom rightfully belong to the trustor. The imposition of a constructive trust is the proper way for the abuse to be corrected. Here, Snepp was in a position of trust and he abused it, by violating an express promise to allow prepublication review of his materials. In doing so he has possibly compromised the Government’s position in sensitive areas, and he should not profit from this. The purpose of the employment agreement was not to allow the Government to censor its employee’s critical views but to prevent the release of classified, nonpublic information. Despite Snepp’s admitted breach of his duty to submit to prepublication review, the Government was not harmed here as his book contained no classified, nonpublic material. Constructive trust is a trust that arises by operation of law whereby the court imposes a trust upon property lawfully held by one party for the benefit of another, as a result of some wrongdoing by the party in possession so as to avoid unjust enrichment. Unjust enrichment is a principle that one should not be unjustly enriched at the expense of another. Here, the actual damages attributable to a publication such as Snepp’s generally are unquantifiable.